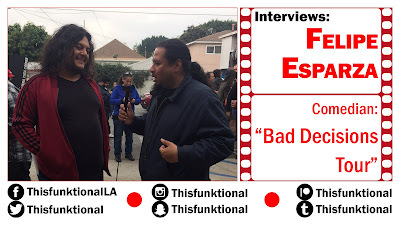 Comedian Felipe Esparza talks with Jesus Figueroa, @Thisfunktional of Thisfunktional.com, about his ongoing "Bad Decisions Tour." Esparza talks about the time it has taken to write the comedy for the "Bad Decisions Tour," bringing tickets with no service charges down to Boyle Heights' Primera Taza and the support from the neighborhood friends and comedian buddies. Tune in to Esparza's "What's up fool? Podcast at FelipesWorld.com. Felipe Esparza's "Bad Decision Tour"